A sizzling brand purpose sets out how a company intends to change the world for the better. Its role is to unite customers and culture alike in the pursuit of that intention. It’s a statement of belief, of hope, of pursuit. It’s born of a wish to see the world put to rights. Having fielded a number of inquiries this week about how to develop a purpose, I thought I’d share how The Blake Project approaches such a critically important task. First and foremost, a purpose should never be developed in isolation. This affects your entire organization. It should involve the senior leadership team to start with, and then be socialized for discussion. The discussion itself shouldn’t revolve around the words (because that quickly becomes semantic nit-picking). It should focus on the passion, on the biggest belief you share and on the implications of holding that belief for everything you do. Don’t tell your people and customers about what you want to see change in the business. State what you fundamentally believe must change in the world. Coke wants to see more happiness. Disney wants to see more magic. Virgin wants to see more rebellion. Google wants to see more things found. What does your brand most want to see happen? What do you passionately want to see stop? Whatever you decide: that’s the goal. And it should be one you are prepared to shout from the rooftops. What is your brand going to do to make that change happen? The answer to that question must define your unique involvement. It must help explain why you are most qualified to be trusted in this pursuit and how everyone you care about (including of course your customers) benefits from you trying to get there. It must shed light on your agenda – and in so doing, it must reveal your humanity. Your purpose should be the goal that everyone who works at your workplace and buys from your brand is most committed to see happen. That’s the big picture. But your purpose must also be able to be framed in such a way as to inspire people at a highly transactional level. 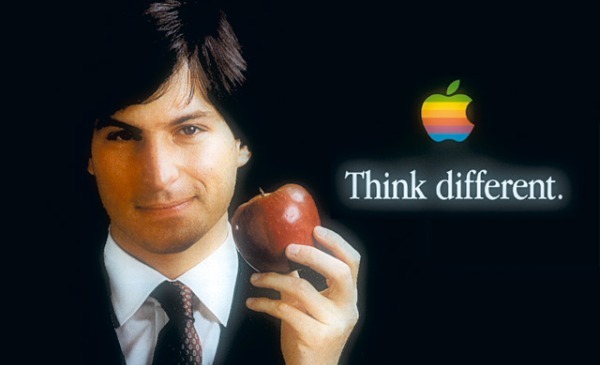 Steve Jobs didn’t instruct people to “Think different”. Instead, he encouraged them to continually question what they were doing by asking: “What are you doing today to think different?” Such a benchmark question pushes people to evaluate their actions against the impact they will have. Such questions bring the purpose right down to what anyone is doing in any given moment. If you can’t frame a benchmark question from your purpose, it isn’t personal enough and therefore it risks being less relevant. Virgin: Screw business as usual and let’s see what’s possible. Twitter: The fastest, simplest way to stay close to everything you care about. Some years back, I was fortunate to meet author and speaker Ian Percy at a conference. He generously gave me a copy of his wonderful and succinct book “The Power of Purpose”. It makes the business case for purpose powerfully and deliberately, and includes this simple idea that I use religiously because it separates in the clearest terms the business case for what you’re doing from the purpose you should promulgate. When you retire and your grown children or their children come to you and ask you to explain why you spent so much time at work, what story will they most want to hear? Will their interest match your purpose? Both statements aim for the same result if you’re a pharmaceutical company – the business can achieve highly attractive returns on capital by curing a significant disease – but the purpose, the reason you’re asking people to come to work, couldn’t be more different. In the first instance, you’re asking people to show up to achieve a financial effect. In the second case, you’re asking them to help stop a child-killer. A purpose that is not worth sharing is not worth having.